Social Media is not something you jump into quickly and start signing up for everything. Listen first, create a strategy, decide what you want out of it and start small. Do one or two things well and then add more. Consider how much time you want to devote to social media. The biggest complaint I hear is that social media takes too much time. It doesn’t have to take much time, but it does require a little discipline and self-control. Don’t start clicking around on every link you see and set timers, have a schedule and stick to it. What do you want to accomplish with your social media campaign? Are you looking strictly for a larger customer base? You could be looking for a higher awareness of your brand or service. Maybe you want to educate the market. Perhaps you want to form a Mastermind group. Be clear about it in the beginning and that will outline your strategy. Are your customers online? Of course they are – but where are they? If your business is local your strategy will be slightly different. How will you measure your success? Make sure you have measurement strategies in place before you begin – what percentage of new business are you getting from social media? Find your Customers – You have to meet your customers where they are talking. The important thing is to join in the conversation and add value. Google Alerts – Set this up for key words in your industry to see what is being posted on blogs and websites. If you are an author, you can also put in the title of your book or your name. Make sure to put phrases in quotes to get an exact match. Blog Searches – http://blogsearch.google.com or http://www.technorati.com. Find the blogs in your industry and see how they are organized and what they post about. Subscribe to them with an RSS feed to get the updates. Twitter Search – http://www.search.twitter.com then click on the Advanced Search to get specific keywords and regions. You don’t have to have a twitter account to find out what people are talking about. Facebook Search – Use http://www.facebook.com/search. Select Pages to limit your search to just Pages. Search on keywords in your niche to see what people are doing. A lot of times blogs will have a Facebook button so you can see what someone has created that way. YouTube Search – YouTube has amazing searches based on keywords. If you do use YouTube, make sure you put a lot of keywords into your videos so you come up in the searches. Once you’ve listened and determined where you want to be participating, it’s time to get started. Start by doing just one or two things well and then tackle something else. Facebook – You will want to build a Facebook Page, but before you can do that, you need to have a personal profile. Don’t worry about privacy – you can lock that all down so no one who is connected to your business page will see that crazy picture your nephew posted on your wall. Your personal profile simply allows you to be the administrator of your business page. Then to get your Page started, go to http://www.Facebook.com/pages/create.php. Make sure you create an “Official Page” not a “Community Page”. Be careful when choosing the Page Name and Type of business because you can’t change the type of business later. You are able to edit the name for a short amount of time but you are better off starting with the right name from the beginning. Twitter – Signing up for Twitter is easy – all you need is an email address and then you select a Twitter ID (username) and password, it can be confusing to navigate and even more confusing to understand the lingo. A few of the terms that you need to know when you start tweeting. @Reply – Use to directly talk to someone or mention them. If you put someone’s name here, they will see it in their Mentions area and know you are talking to them, i.e. @Oprah Love your show. Everyone who follows me will see that I said that to Oprah. You can talk anyone you want to, even if they aren’t following you. DM or Direct Message – A DM is a private message. No one sees this except for you and the person who sent it. You can only send someone a private message who is following you. A word of warning, there are “auto-DM” programs out there to automatically send DMs out so a large percentage of your DMs are going to be spam. # or Hashtag – A hashtag is a way to break a conversation out into a type of “chat room”. Used a lot for conferences or events where everyone wants to talk about a mutual subject but may not be following the other people, i.e. #CES2011 or #MOMeoChat. Use Tweetchat.com to follow these conversations or participate in them. RT or Retweet – A retweet is a way to pass along information from one person you are following to all your followers. If you like a quote or website that someone tweets, retweet it to spread their message. Retweets are the reason for the viral nature of Twitter. 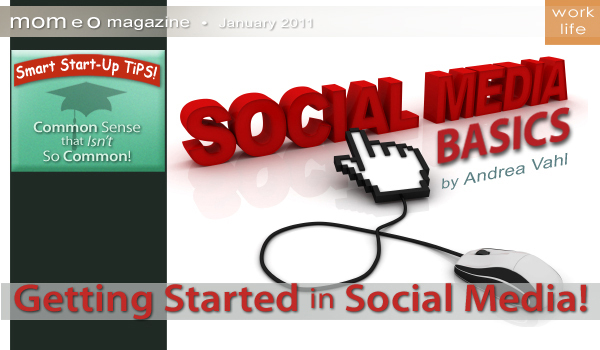 For a video tutorial of getting started with Twitter, go to http://www.grandmamaryshow.com/twitter-tutorials or you can take a look at my e-book How to Use Twitter to Grow Your Business! LinkedIn – LinkedIn isn’t just for job searching. If you do nothing else, make sure you just fill in your LinkedIn profile so you can respond to LinkedIn requests from others. Because LinkedIn gets high page rank for people searching for you, it’s good way to have people find you. Be sure to include your picture in your profile so people can confirm it’s you and although it’s not necessary to have a complete profile, it’s a good idea to fill in as much as you can. Facebook – Start building your fan base by suggesting your Page to your Facebook friends and let your subscriber base know where to find you on Facebook so that you can start growing your Likers. The best way to build your fan base is to maintain an active page – post every day to connect with your community and stay in the forefront of their minds. To access more Facebook tutorials go to http://www.grandmamaryshow.com/facebook-tutorials or get the guide:How to Use Facebook to Grow Your Business! Start a conversation – That is really what Twitter is all about: meeting people at a big “cocktail” party. How would you talk to someone if you just met? You wouldn’t immediately begin by blasting them with your website. Don’t be rude. There can be some of that but if you connect first, people will be more interested in what you have to say. Be a regular – If you’re there at the same time every day, you will develop relationships. It doesn’t have to be long – just 5 to 10 minutes at a time. Offer value – Think about what your followers are looking for. Retweet what is important to your followers. Pass along great tips. Be fun – Don’t be boring – say some crazy stuff to show your personality. Don’t be spammy – Don’t only tweet your blog or anything else you have to sell. Retweet, reply and think about what other people need. Make it 80% about sharing and providing value and 20% about tweeting out your own promotions. Integrate your message – But at the same time, don’t never plug yourself. Let people know what you are about and what you offer. Form relationships before asking someone for something – Don’t Direct Message people immediately asking them to plug your stuff. Connect. Don’t overload – Walk away. Take a break. You’ll have more to talk about. Be responsive – Thank people for retweeting something important to you. Measure and track – Make sure your time is effective. There are lots of tools you can use to measure and automate. LinkedIn – Add Contacts by importing them or searching for people you know. You can send a note with your invitation to remind them how you know them. Use the search feature in the upper right corner and click Advanced Search to find people by job title, location or key word. Fill out your Summary section with all the ways you help clients. Use lots of keywords to help you come up in searches for your specialties. Get recommendations from past clients and recommend others. Join Groups to connect with new people. You can post updates in the group and group members will get a notification. Also if you search for customers or clients that you are targeting, find out what groups they belong to and join them and connect with them there. Wherever you decide to get started in social media, stick with it, be regular and don’t get discouraged. It takes time and patience to build up your connections. But it can be extremely worthwhile to your business, not to mention being a great place to find new friends! Posted on 2011, January 21, in Tools and tagged Best Tools, Tools. Bookmark the permalink. Comments Off on Social Media Basics – Getting Started in Social Media.